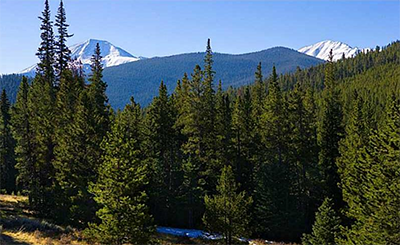 Muggins Gulch is a newer subdivision of very large lots in the Swan River Valley just north of downtown Breckenridge. Few of these premier homesites have been developed, but even at full capacity there is ample privacy in this gated community. Muggins Gulch Road is located off Tiger Road, about 4 miles east of the Breckenridge Public Golf Course, which doubles as a Nordic ski center in the winter. Town or county open space sNorth of the town of Breckenridge and far up Tiger Road on the powerful Swan River are some new neighborhoods made up of large building lots. Public lands around Breckenridge make it possible to ride a bike on single track all around the outside edge of civilization, and cover this area without duplication for hours. Trailheads to get into this system are easily accessible from Muggins Gulch. Breckenridge Golf Club and its winter alter-ego, Gold Run Nordic Center are just down Tiger Road, which is lined with a bikeway. Public transit stops near the intersection of Tiger Road and Highway 9, and bikes are first-come, first-loaded on the free Summit Stage - the countywide bus system. Muggins Gulch is zoned for horses, and a neighboring subdivision, Summit Estates, maintains an established equestrian center. Size:the first single family home built in 2016 is about 7,000 sq.ft. From the center of Breckenridge, head north on Highway 9. After about 3 miles turn right on Tiger Road, and travel toward the east for about 4 miles, where you'll find Muggins Gulch Road. The properties in this neighborhood will be found on this, or on small rural roads off this main road.